David Haye Arrested Over £341,000 "Bounced Cheque"
British former unified cruiserweight and WBA heavyweight champion David Haye has been arrested in the Islamic state of Dubai over claims a £341,000 cheque for a property he is building bounced. 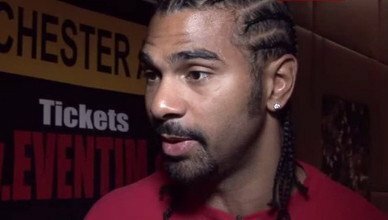 Numerous media outlets in the UK are reporting that the “Hayemaker” has had his passport seized, which would explain his no-show at a BAMMA MMA event at the weekend. 168lb Super Middleweight champion Carl Froch filled in instead. It’s another blow for Haye who has been telling boxing fans for as long as they will listen that he is coming back to the ring. “When?” seems to be the question on many people’s lips, as 2015 was supposed to be “the year”. Recently he has linked his name and supposed comeback to that of current WBC champion, the unbeaten Deontay Wilder, and even the most loyal of Haye fans are finally getting tired of what seems to be a steam of constant PR excercises in a bid to stay relevant. Unless he gets in the ring again, then he will struggle to stay relevant to true boxing fans anyway, and already I’m of the belief that his new-found celebrity away from the ring is probably the best thing for him. Actions speak louder than words for crying out loud. That’s something most people learn as small children and David seems to do far more of the latter than the former these days. Haye, who has an estimated wealth in excess of £20 million could have been in real bother. In the notoriously strict state bounced cheques are punishable by fine yet can lead to PRISON in some cases. Instead of tweeting about pop concerts and holidays, when you get your passport back David, get back home and get in the ring. Because soon, even in your own country, NOBODY will care anymore. Next boxing news: Chavez Jr Calling People Out Already??? “Desperate” To Redeem Himself?